A wide range of release agents for electrical applications (silicone based); composite tooling and components, both sacrificial (wax based in solven, wax paste, Ram wax, PVA) as well as semi-permanent release agents made by Marbocoate UK. Marbocote Mould Sealer The Marbocote Mould Sealer is recommended to seal micro-porosity in polyester, vinylester GRP, epoxy and aluminium moulds. 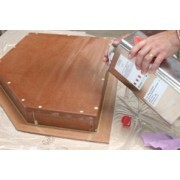 After cleaning the mould, apply 2 coats of Mould Sealer to prime and seal the mould surface. Following a short cure, the mould i..
General purpose, light weight easy to sand Body Filler. Motorcar repairs, tooling, negatives. Good adhesion to wood and metals. ..
T5 is a high performance release agent, silicone based used to manufacture epoxy castings, insulators and bushings by the pressure gelation method. Steel Moulds. Mould temperature about 170 C. ..